Man and Van Mates is a company providing relocation services. 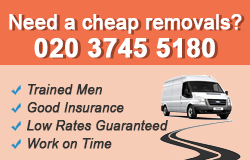 The company specialises in delivering man and van services in Fulham, SW6. Your car might do a great job when you have to carry smaller items but you definitely can not fit a fridge or a sofa in the boot. That’s why you need our man and van services that make the carrying of heavy items from one location to another fast and easy. Our team of hard working professionals will take care of everything. You don’t have to lift a finger. They will come and do the heavy lifting and loading. And all that will cost you a small sum of money. We now cover Fulham, SW6 as well as all the other Greater London areas. Call an operator now and get a quote. Our London man and van service guarantees to be cheaper, faster and more reliable than most larger moving companies. We know the London area like the back of our hands, however, our talents don’t just stop there, we also do long distance moving. Whether you are looking to transport a single item or an entire household, we are the man and van service for you. We come with all our own packing and padding equipment, thus ensuring your valued belongings are safe. We are also fully insured, and can supply current references on request. So pick up the phone today and make an appointment for one of our experts to come out and visit your property. Our London based man and van service is on call 7 days a week. We guarantee that within 24 hours of your phone call we will come out to your property to assess what needs to be moved. We offer a full comprehensive service or just basic transport. We have all the moving equipment necessary to safely and efficiently move any item, and carry full insurance. No job is too big or too small for us to handle, we don’t just supply our man and van services to residential homeowners, we also cater for commercial moving too. So if you are looking for a reliable movers, then pick up the phone now and speak to one of our customer advisor’s. There a million different reasons for which you may want to clean your garage or attic and there are even more things you can do with the objects you have found. If you decide that you want to move them somewhere else, we have solution for you how to move them from point A to point B in the London area- our man and van services. If you want to give it a try we invite you to call our agents who will register your order and will send a team to your home no matter whether you live in the centre of the city or in Fulham, SW6.